Did you know that one in three children in the United States face a future with diabetes? The Fayette County Diabetes Coalition works to make a difference in the lives of these children and all of the people in our community living with diabetes. FCDC wants to let you know that it’s not too late to join their team as part of the American Diabetes Association’s Step Out Walk to Stop Diabetes this Saturday, June 2, at Keeneland. There is no registration fee. For more information, click here, or call Sarah McMahan at ext. 2347. Human Resources arranged for the Kentucky Blood Center Bloodmobile to visit the health department May 23, at the 808 Warehouse. There were 13 registered donors (five were first-time donors), resulting in eight donations that helped 24 very grateful Kentucky patients. Winners of the three gift cards will be announced soon. If you have any feedback about yesterday’s blood drive and/or suggestions for the next blood drive, please contact Sara Gabbard. 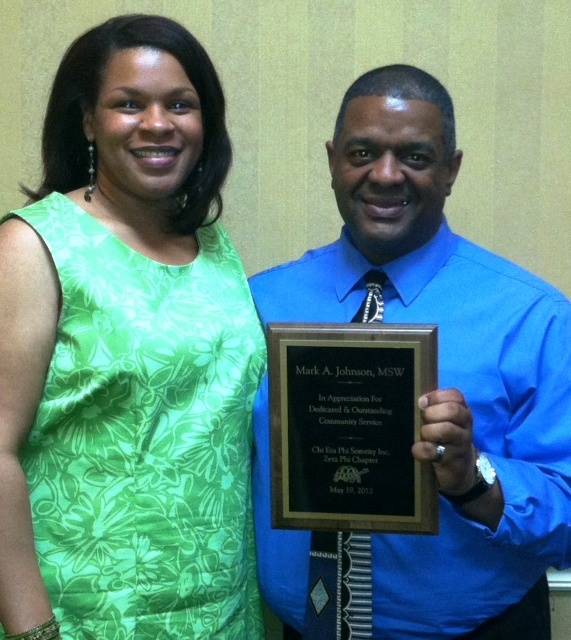 Mark Johnson, health equity team leader, recently received special recognition for his continued dedication to improving the health of individuals in our community. Board of Health member Kacy Allen-Bryant presented Johnson with the Humanitarian Award from Chi Eta Phi Sorority Inc. Zeta Phi Chapter, a professional organization for registered nurses committed to serving and improving the health outcomes of minority communities. Johnson also received word that he has been named a United Way Bluegrass Community Connector and will be recognized during a ceremony on June 12. He will join a small, select group who has been recognized by peers as a leader in Central Kentucky. Out of 5,000 nominations, his name rose to the top of the list. Three Lexington-Fayette County Health Department nurses and a HealthFirst Bluegrass nurse received honors for their work. Want to enhance your workplace skills, techniques and relationships? The Human Resources department continues to offer additional training and development programs, and in order to keep you informed about the latest offerings, they have launched a new Training & Development page on the Employee Intranet. Help us spread the word about these upcoming events and classes. Please contact Greg Hiles for copies of any of these flyers. Marie Cunningham received the HealthFirst Bluegrass Employee of the Month Award for May from Board of Directors Chair T.A. Lester and Sandy Price. LFCHD staff members took part in a large-scale preparedness training and exercise May 16-17 at the Lexington Veterans Affairs Facility on Leestown Road. The event simulated a tornado, allowing emergency responders to test the evacuation, care and treatment of people in a hospital damaged by the storm. Planners used last year’s tornado in Joplin, Mo., and this year’s tornado in West Liberty, Ky., as examples. Board of Health Chair Dr. Gary Wallace recognized Dr. Marcia Stanhope for her dedication and tireless support of the health department during the May 14 Board of Health meeting. Dr. Stanhope served on the Board from 1999 to 2012.